Stainless steel is found throughout many homes, from the refrigerator in the kitchen to the trim on the living room coffee table. When you have stainless steel in the home, you quickly realize just how fast fingerprints, smudges, film and dust build up on the surface of the stainless steel. 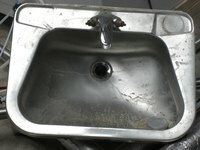 Since commercial cleaning products are costly, a homemade stainless steel cleaner will save money and effectively clean the steel. Twist the lid on your spray bottle to adjust for a fine mist, and spray the stainless steel with a coating of the homemade cleaner. Wipe the solution off with a clean, dry cloth following the grain of the steel. Continue until all steel is cleaned, and always thoroughly dry the steel with the clean, dry cloth to prevent streaking.